The Magic Kingdom is by far my favorite park at Walt Disney World. We always start and end our vacations here because it feels the most Disney to me. Walking down Main Street USA always gives me chills, and seeing Cinderella’s castle there at the end lets me know I’m home. Magic Kingdom is also full of rides, characters, restaurants, shops, and more- there’s enough to fill several days and still have some leftover. 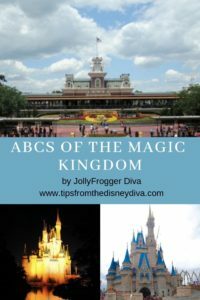 I have a compiled a list of some of the most popular things to see and do at the Magic Kingdom from A to Z.
A- Astro Orbiter. I’ll admit, my family isn’t big on this attraction. The line is usually longer than we want to wait, and the ride vehicles are small which means cramming in together or riding separately. The tower at the top of the ride, however, is neat to look at as you walk through Tomorrowland. 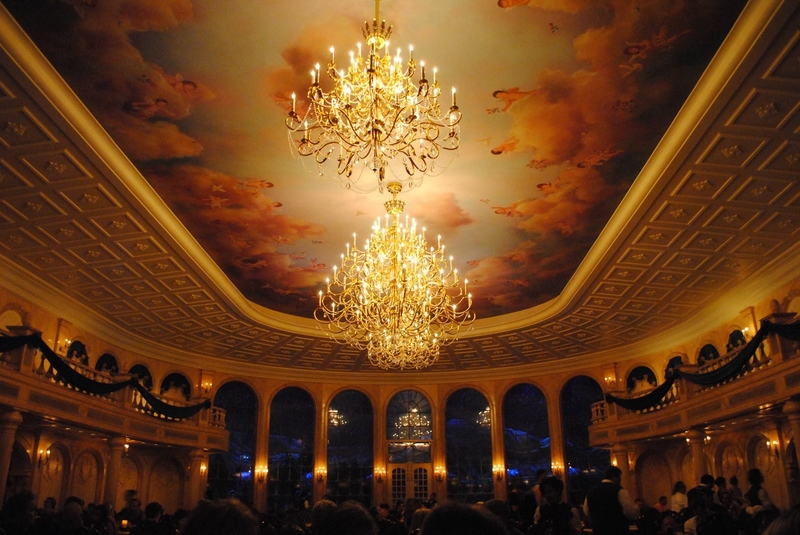 B- Be Our Guest. This popular restaurant is located in Fantasyland. During breakfast and lunch hours, it’s considered quick service although you’ll still need reservations to dine here. At night, it becomes a Signature Dining experience with a 3 course prix fixe menu. It also happens to be one of my favorite restaurants on Disney property because it really feels like you walking through the movie. Reservations are difficult to get, so be persistent if dining here is important to you- and be sure to try the gray stuff, it really is delicious! C- Carousel of Progress. This is another one of my favorites at Magic Kingdom. As a kid, I used to roll my eyes when my father insisted on doing this attraction (which is more of a show than a ride, although the theater does rotate between scenes) but as an adult, I’ve come to enjoy it. Not only do you have a charming show about a family evolving through the 20th century, but you also have a chance to rest your feet and enjoy a break from the sun and heat. Don’t be surprised to find yourself humming “There’s a Great Big Beautiful Tomorrow” the rest of the day. D- Dumbo. Another classic ride at the Magic Kingdom, Dumbo has something special that the other rides don’t- a queue that allows you to wait without just standing in line. When you enter the big-top, you’ll be given a pager that tells you when it’s your turn to ride. While you wait, your kids can play on the playground and you can find a seat and take a load off your feet- it’s brilliant, really! E- Enchanted Tiki Room. 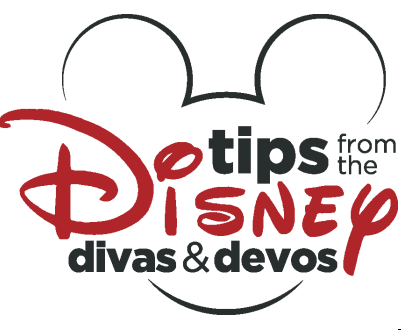 This attraction has all the classic things that I love about about Walt Disney World- animatronics, a charming story line, and a catchy song that will stick with you long after you move on to other things. Sure, it may not be the most thrilling show offered at the parks, but it’s a classic and it always on my must-do list. F- Festival of Fantasy. Magic Kingdom is currently the only park with a parade, and it’s called Festival of Fantasy. If you’re walking through Frontierland, Liberty Square, or Main Street during the afternoon and notice people lining up on the curb, that means the parade isn’t too far away. 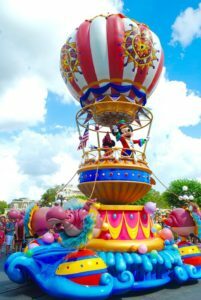 I highly recommend finding a spot to watch Festival of Fantasy- the floats are colorful and creative, the costumes are eye catching, and it’s full of some of your favorite Disney characters. G- Gaston. No one meets like Gaston, no one greets like Gaston, no one makes me wait anxiously in the heat like Gaston. 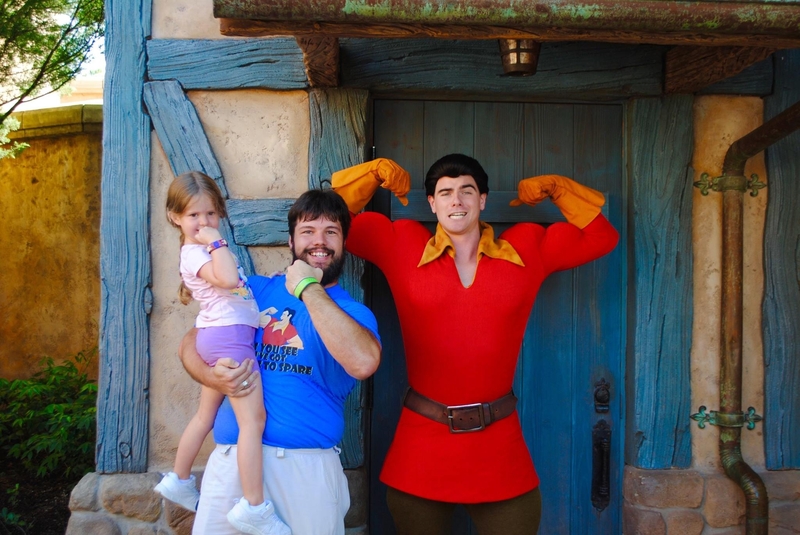 On our last trip, my daughter decided she had a mega crush on Gaston. It us 4 tries to actually meet him (the line kept closing right before we got there), but it was love at 1st sight. While the look on her face was enough to make it worth the wait, the interaction we had with Gaston was just as amazing. He’s witty, he’s sarcastic, he’s full of himself, and he’s awesome. My husband wore his “I’ve Got Biceps to Spare” shirt to meet Gaston and was challenged to a flex-off. It was by far one of our favorite meet-and-greets, and you should definitely make time to say hello to Gaston while you’re in Fantasyland. H- Happily Ever After Nighttime Spectacular. This nighttime show replaced Wishes in 2017 and I have not been fortunate enough to see it yet. It’s full of projections on Cinderella Castle, lasers, and pyrotechnics. I’ve read a lot of good reviews about it, but since Wishes was probably my favorite nighttime show at Walt Disney World, it’s got some big shoes to fill. I- Ice Cream at Plaza Ice Cream Parlor. Florida is usually hot, and nothing cools you down on a hot day like some delicious ice cream. Located on the corner of Main Street USA, the Plaza Ice Cream Parlor is a popular stop for a delicious snack. They offer a large variety of sundaes as well as hand-dipped cones and floats. The Plaza Sundae and Mickey’s Kitchen Sink Sundae are two of the most popular choices, so bring your appetite and stop by for a refreshing treat. J- Jungle Cruise. This ride is another classic, although not one of my personal favorites. Riders board a boat for a 10 minute trip through the waters of Asia, Africa, and South America . 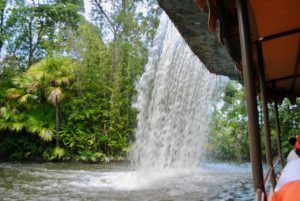 Although the scenery is nice, and the animatronics are plentiful, what makes Jungle Cruise popular are the Skippers and their plethora of corny jokes. In 2017, it was reported that the ride will undergo a major redesign at some point in the future, so if you’ve never taken a cruise on Jungle Cruise, be sure to do so while you still can. Be sure to have your cameras ready, you never know what you might see (like the backside of water!). K- Keys to the Kingdom Tour. If you’re 16 years or age or older and want a great behind-the-scenes look at the Magic Kingdom, the Keys to the Kingdom Tour is something you’ll definitely want to check out. The tour is a minimum of 5 hours long (and includes lunch) and takes you through the utildoor tunnels under the Magic Kingdom as well as several other backstage areas. For example, on the last tour we did, we were able to see the area where the parade floats are stored and got a sneak-peak at concept art for Festival of Fantasy, which hadn’t been announced yet. I would definitely recommend taking this tour at least once. L- Liberty Tree Tavern. If you are a fan of Thanksgiving type food (turkey, ham, dressing, mac and cheese, and rolls for example) and your family has a big appetite, Liberty Tree Tavern may be just the place for you. My family happens to love dining here, so we usually schedule dinner here at least once per trip. If you’re a fan of classic american food but don’t care for the all-you-can eat option, their lunch menu may be a better fix as lunch is served from a menu rather than family-style. M- Mountains (Splash, Thunder, and Space). 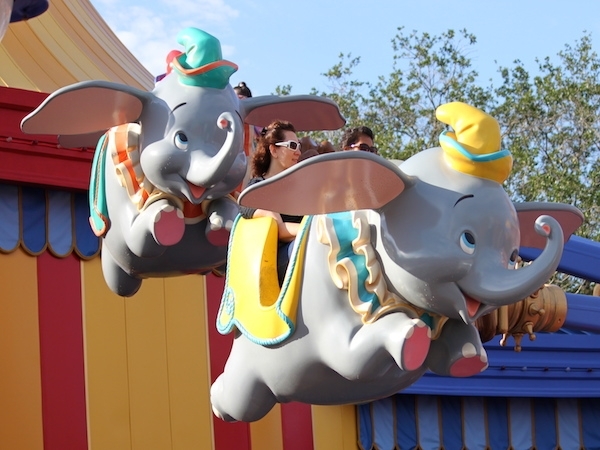 Although Magic Kingdom has many kid-friendly rides, they also have their share of thrill rides as well. 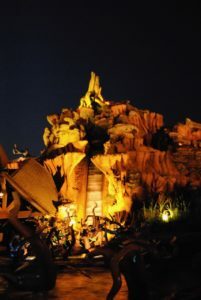 Space Mountain, in Tomorrowland, as well as Splash Mountain and Big Thunder Mountain in Frontierland are definitely offer a triple helping of thrills for riders. Zip through the dark of space, ride a log flume 50 ft down into a brier patch, or hop aboard an old mining train for the wildest ride in the wilderness. Conquering these mountains is definitely not for the faint of heart. N- Nine hundred ninety nine ghosts of The Haunted Mansion. Given my love for all things Halloween, it’s no wonder that Haunted Mansion is one of my favorite rides at Magic Kingdom. Climb aboard a doom buggy and let your ghost host take you on a tour. If the 999 ghosts inside detect your sympathetic vibrations, they may even begin to materialize for a swinging wake. 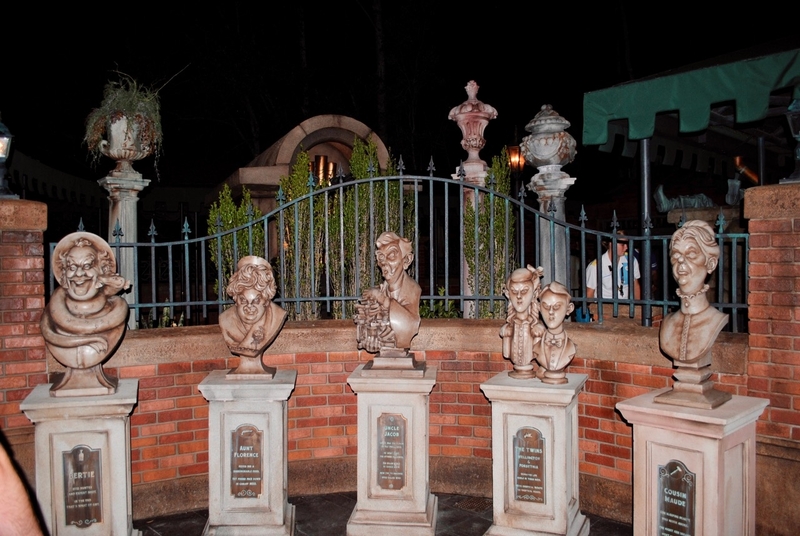 But be cautious- or else a hitchhiking ghost may jump in your doom buggy and follow you home. 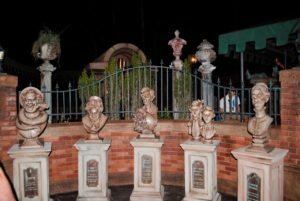 Disney Magic Diva shares some tips for visiting the Haunted Mansion with young kids here. O- Oak Tree. 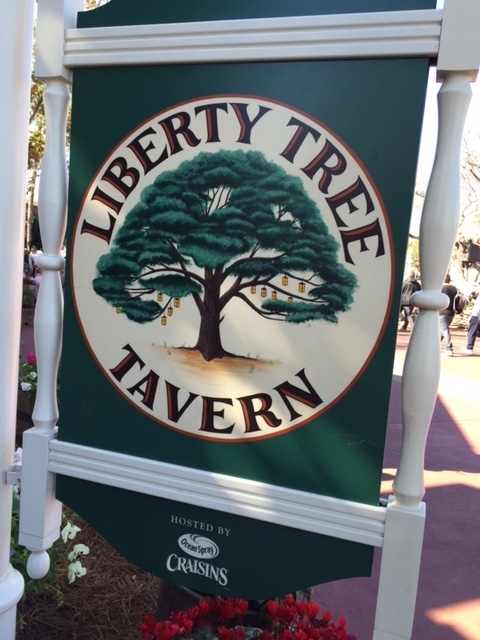 If you’ve ever visited Liberty Square, you probably noticed the Liberty Tree. This giant oak tree is over 100 years old and was moved from elsewhere on property when Liberty Square opened in 1976. In the tree you may notice 13 lanterns hanging, each representing one of the 13 original colonies. P- Peter Pan’s Flight. If you’ve ever wanted to soar over the streets of London, like Peter Pan, then this is the ride for you. 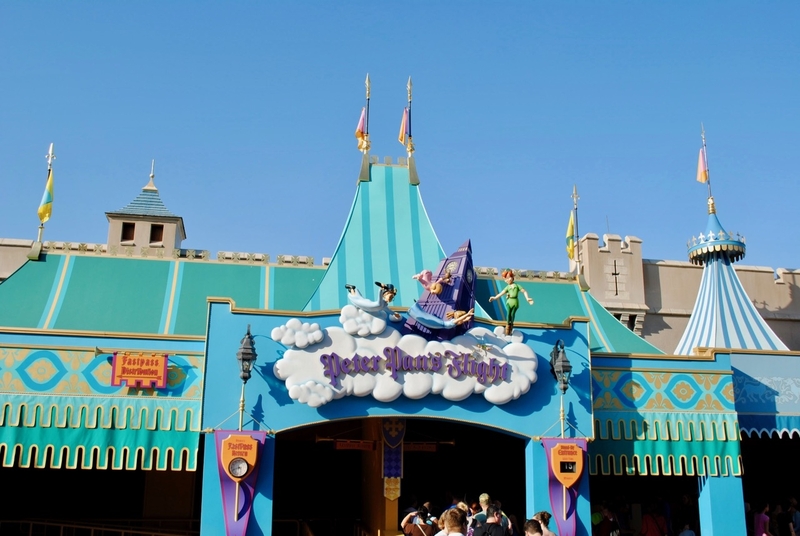 This ride uses an Omnimover ramp like Haunted Mansion, and allows you to take flight on a magic pixie-dusted pirate ship for a trip over some of the iconic scenes from Peter Pan. 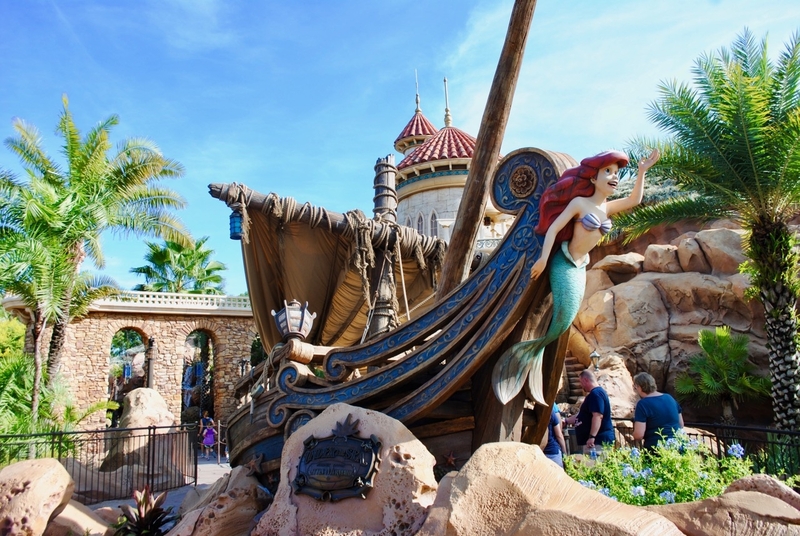 You’ll see the Darling nursery, Mermaid Lagoon, Hook and Peter Pan dueling it out on the Jolly Roger, and more. This family-friendly ride is located in Fantasyland, across from It’s a Small World. The line is usually quite long, and although the interactive queue is fun, I still recommend trying to snag a FastPass+ for this ride. Q- Quick service dining. Whether or not you have the Disney Dining plan, quick service dining is a great way to grab something to eat without having to worry about making a reservation (with the exception of Be Our Guest. There are quick service dining locations all over the Magic Kingdom, so there’s bound to be one close by whenever your stomach starts growling. Some of my favorite quick service places at Magic Kingdom are Casey’s Corner (Soarin Diva shares her review here), Cosmic Ray’s Starlight Cafe (you can read Soarin Diva’s review here), and Columbia Harbor House. If you’re on the Quick Service Dining Plan, Canadian Diva has a great article about getting the most of out dining credits that you should read. R- Rapunzel bathrooms. 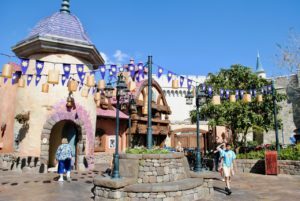 If you’re a big Rapunzel fan, make a point to check out the restrooms in Fantasyland, near Peter Pan’s flight and It’s a Small World. I know, it sounds weird for me to tell you to check out bathrooms, but trust me here. 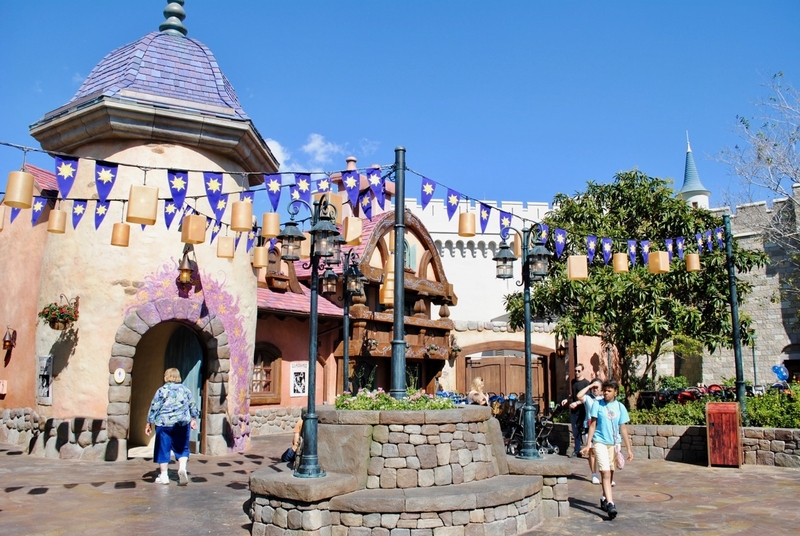 You can see Rapunzel’s tower in the distance but the bathrooms themselves are the real attraction. Just like in every other area of the parks, Disney directed all of their attention into the details. 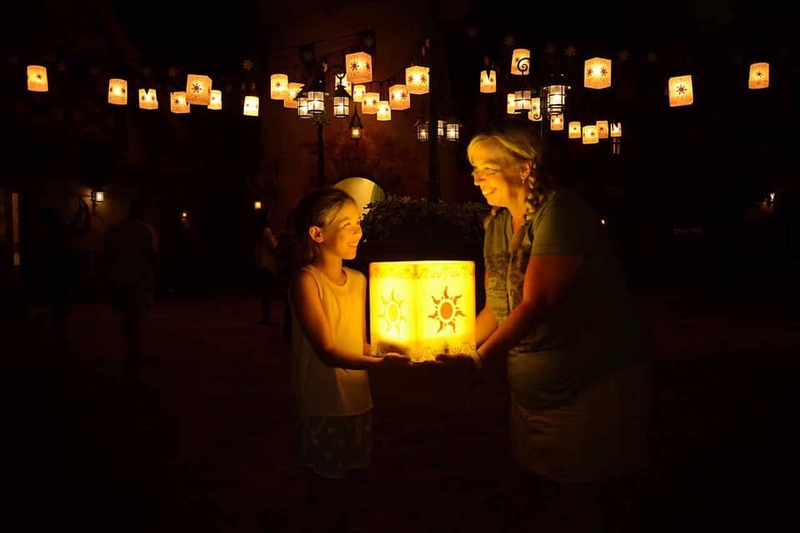 Check out the wanted posters on the walls, the artwork in the bathrooms themselves, and be sure to swing back by at night when all the lanterns are lit. 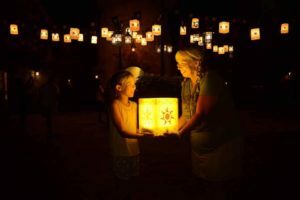 This area has become so popular that Disney even added a cool night-time magic photo opp where you can have your picture taken with one of the glowing lanterns. For all that, it’s worth a stop when you’re passing through the area. 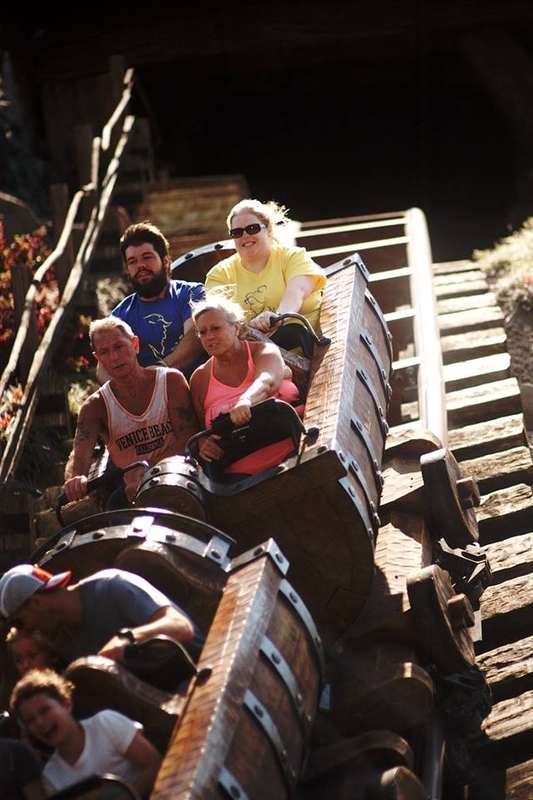 S- Seven Dwarfs Mine Train. One of the newest, most popular rides at Magic Kingdom is the Seven Dwarfs Mine Train. This coaster is located in the new party of Fantasyland and features a unique ride vehicle that swings side-to-side as the train moves forward. You’ll swoop and dash around and at one point even drop in on the Dwarfs in the mine. It’s billed as a family coaster, but it does have a height restriction and might not be popular with younger kids. Being relatively new, Seven Dwarfs an extremely popular attraction, and the wait times are often exceptionally long, so be sure and get a FastPass+ reservation if it’s on your must-ride list. T- Tomorrowland Transit Authority PeopleMover. “Paging Mr. Morrow, Mr. Tom Morrow”. If you’re familiar with this phrase, then chances are you’ve ridden Tomorrowland Transit Authority PeopleMover (TTA) at least once. Some of you may know this attraction as the WEDway PeopleMover. This attraction can be found in the middle of Tomorrowland, as the name would suggest. It also happens to be one of my favorite ways to get off my feet and take a little break. TTA zips around the tops of most of Tomorrowland, taking you past several attractions such as the former Stitch’s Great Escape, Carousel of Progress, and Monster’s Inc. Laugh Floor. It takes you in to Space Mountain (where you can occasionally get a glimpse of what it looks like with the safety lights on) and Buzz Lightyear’s Space Ranger Spin. The ride lasts about 10 minutes and there’s hardly ever a line, which makes it a great option to take a short break and check out Tomorrowland from a different angle. U- Under the Sea: Journey of the Little Mermaid. 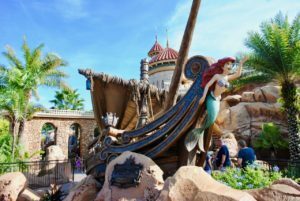 Another addition to Fantasyland during the most recent expansion, Journey of the Little Mermaid is another fun option for the whole family. Much like Peter Pan and Haunted Mansion, this ride uses and Omnimover to load guests into a pink clam shell for their journey under the sea. Be prepared to sing along with some of your favorite songs from the movie, and soak in all the details- the Under the Sea scene is particularly amazing and there’s something new to see everywhere you see! V- voyage around the world in 10 minutes on It’s a Small World. If you find yourself in Fantasyland and your feet are aching, or you just need some time in the air-conditioning, consider It’s a Small World. Board a boat and relax as you embark on a 10 minute voyage around the world. 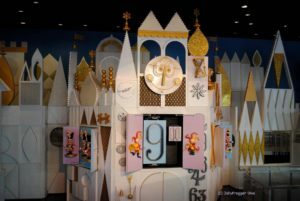 You’ll see dolls dressed in costumes from countries they represent and hear the “It’s a Small World after all” song sung in several different languages (and probably find yourself singing along in your native tongue!). In fact, you’ll probably find yourself humming that song in your head long after you disembark. If you time your visit just right, you may even get to see the clock on the wall behind the load area come to life. W- Walt Disney World Railroad. One of my favorite ways to get around the Magic Kingdom is the Walt Disney World Railroad. With stations located on Main Street, Frontierland, and Fantasyland, you can get to most locations in the park without a lot of walking. It’s also fun to ride the entire loop (known as the Grand Circle tour) back to where you started, just enjoying the sights and sounds of the Magic Kingdom. The Walt Disney World Railroad will be closed temporarily starting December 2018 while construction for the new Tron ride takes place. 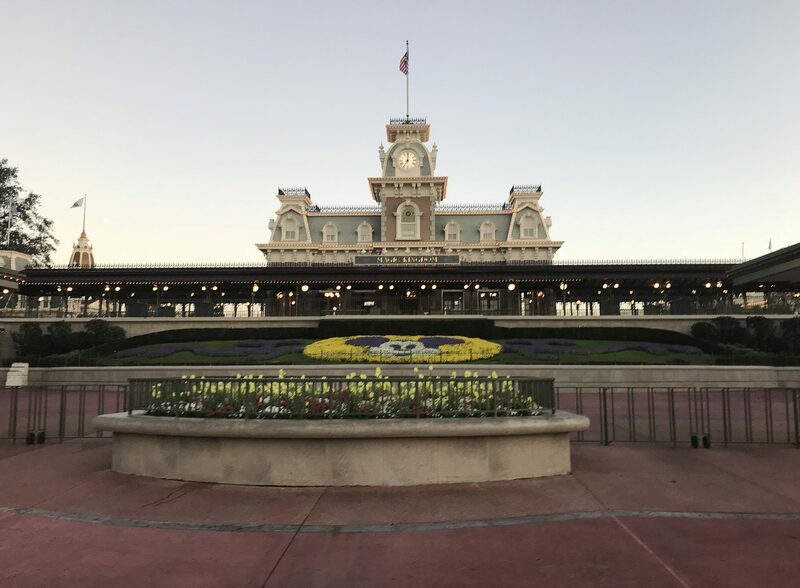 It sounds like you will be able to visit the Main Street station to see the trains up-close, so be sure to take advantage of that opportunity if you find yourself visiting the Magic Kingdom during the closure. X- eXcalibur. 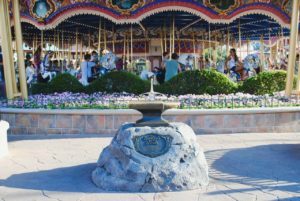 Located in front of Prince Charming Regal Carousel, you’ll find Excalibur encased in stone. Be sure to try your luck at pulling the sword from the stone- rumor has it that some lucky guests are occasionally successful at this seemingly impossible task. Y- Yo ho, yo ho a Pirate’s life for me. They don’t call me JollyFrogger Diva for nothing! Pirates of the Caribbean is by far one of my favorite attractions at Magic Kingdom. It was the 1st ride I ever rode at Walt Disney World and I continued that tradition with my husband and eldest daughter (it will also be the youngest’s 1st ride assuming it isn’t down for refurb the next time we visit). There’s something about that sulfur smell of Florida water and the cool dampness of the fort’s interior to let me know I’m home! Hop on a boat and set sail for some pillaging, plundering, and another catchy song you’ll find yourself singing in your head the rest of the day. Be sure to keep an eye out for Captain Jack Sparrow- you never know where that mischievous scallywag will pop up! Z- Zeke & Zeb & Ted & Fred & a bear named Tennessee. If you aren’t familiar with these names, they are the 5 bears that make up The Five Bear Rugs band featured in the Country Bear Jamboree. ‘ll admit it- I am not a fan of this show. Maybe it’s because the accents and music are pretty much what I experience at home on a daily basis, or maybe it’s because my father used to force us to sit through the show at least once on every vacation. Whatever my reasons, the Country Bear Jamboree is considered a classic by many Disney fans so I included it on my list. You can catch the show while visiting Fronteirland so if you’re looking for a chance to sit down and rest, consider checking out this show. So there you have it- some of the classic Magic Kingdom attractions from A to Z. 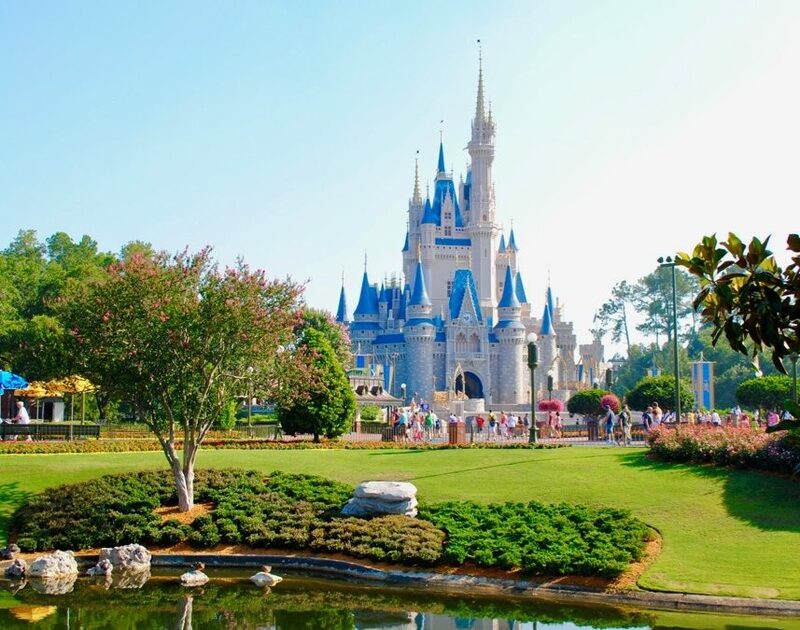 There are many more awesome attractions I couldn’t fit on this list, so be sure to allow yourself plenty of time to explore the Magic Kingdom on your next visit. If you need help planning your next trip or just want a free quote, click here to contact Patricia at All for Dreams Travel. This one one of the most fun posts about Disney I’ve read lately! I usually skim, and you had me reading every creative letter association. Great article!